the yacht America. William I. Koch Collection. Capturing the Cup: Yacht Racing During the Gilded Age, on exhibit at the Flagler Museum from October 16, 2012 through January 6, 2013, tells the exciting story of yacht racing in America during America's Gilded Age, the period that has also become known as the Golden Age of the sport. Works of art, artifacts, historic films, and elaborate gold and silver trophies made by the most important silversmiths, illuminate the history of the great yachts, races, and personalities of the period, like "the Gamest Loser in the World of Sports," Sir Thomas Lipton, who won the hearts of Americans in spite of losing five America's Cup challenges. Among the significant objects on display is a rare perfect replica of the silver America's Cup, the oldest and most coveted prize in the world of sport. This exhibition is sponsored by PNC Bank and the State of Florida, Department of State, Division of Cultural Affairs and the Florida Council on Arts and Culture. Competition for what came to be known as the America's Cup helped ignite a craze for yachting and advanced nautical design in this country. The international competition has been a showcase for the best in the world of yachting ever since. During the late nineteenth century, America's Cup competition between the United States and Britain was fierce. Competitive tensions came to a head during the unsuccessful 1893 and 1895 challenges by the Earl of Dunraven, resulting in disagreements over the rules, an allegation of cheating, and ill will on both sides of the Atlantic. Though he didn't race his yachts, Henry Flagler was keenly interested in the sport. A member of several clubs including the New York Yacht Club, Flagler owned sailing and steam yachts and attended regattas. In 1883 or 1884, Flagler purchased the famous schooner Columbia, a successful 1871 America's Cup defender. Flagler and his steam yacht Alicia, built for him in 1890, served on the New York Yacht Club patrol for the 1895 America's Cup races. A number of artifacts and works of art related to Flagler's yachts are featured in the exhibition, including a rare painting of the Columbia by maritime artist William G.Yorke. While it could cost enormous sums of money to compete in the major regattas, winners were awarded large cash purses and costly trophies. Leading silversmiths of the Gilded Age such as Tiffany & Co.; Black, Starr & Frost; Gorham Manufacturing Company; and Dominick & Haff were commissioned by yacht clubs and wealthy sportsmen to create some of the most lavish presentation pieces ever made. The high cost and elaborate design of yachting trophies are evidence of the prominence of the sport in America during the Gilded Age. 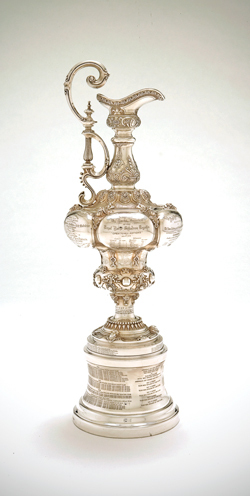 Capturing the Cup will feature a number of important yacht racing trophies, including: the Goelet Prize for Sloops, offered annually by Ogden Goelet; the Drexel Cup, provided by John R. Drexel; the Brokaw Trophy, donated by W. Gould Brokaw; the Ogden Goelet and James Gordon Bennett Cup, co-sponsored by two of the period's most important yachtsmen; and two King's Cups, presented by Edward VII and George V. Capturing the Cup will present the fascinating stories of the donors of these prestigious prizes, the champions, and their yachts. December 11, 2012 6:30 p.m. In conjunction with the exhibition Capturing the Cup: Yacht Racing During the Gilded Age, on exhibit at the Flagler Museum from October 16, 2012 through January 6, 2013, author Michael D'Antonio will present Sir Thomas Lipton and His Race for the Cup. D'Antonio is the author of many acclaimed books, including A Full Cup: Sir Thomas Lipton's Extraordinary Life and His Quest for the America's Cup, and he previously presented The Sweetest Company Town Ever Built: Hershey, PA as part of the 2007 Whitehall Lecture Series. Among his many awards is the Pulitzer Prize, which he shared with a team of reporters for Newsday. Today he is more famous for his tea, but in the world of Gilded Age yachting, Sir Thomas Lipton's name was synonymous with a passionate love of yacht racing and good sportsmanship. After great success building his empire of markets, factories, and tea plantations, Lipton set his sights on winning America's Cup. He spared no expense to capture the most coveted of all sporting trophies, despite the fact that he didn't even know how to sail. For his five attempts to challenge American champions between 1899 and 1930, Lipton built five state-of-the-art racing machines, Shamrocks I through V. Lipton also promoted yacht racing by donating elaborate trophies to encourage yachting competitions around the world. Lipton's generosity and unwavering good will, despite repeated and expensive America's Cup losses, earned him the admiration of sporting fans worldwide, and the nickname "The Gamest Loser in the World of Sports." In conjunction with the exhibition, the Museum invites fourth through eighth grade children to a special gallery tour with the Education Director followed by a hands-on learning activity. December 4, 2012, 2:45 p.m.
Space is limited. Please call (561) 655-2833 to R.s.v.p. 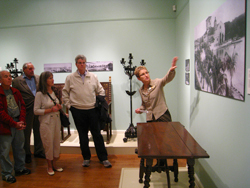 Join exhibition curator Tracy Kamerer for a tour of the Flagler Museum’s fall exhibition Capturing the Cup: Yacht Racing During the Gilded Age. Ms. Kamerer will tell the history of the great yachts and races of the Gilded Age, beginning with the story of the race for what became to be known as the America’s Cup, which focused the country’s attention on yachting. Great personalities in yacht racing will also be discussed, such as “The Gamest Loser in the World of Sports,” Sir Thomas Lipton, who won the hearts of Americans after losing five America’s Cup challenges. Co-sponsored by two of America’s most important yachtsmen, the silver Ogden Goelet and James Gordon Bennett Cup was made by Tiffany & Co. in 1894. 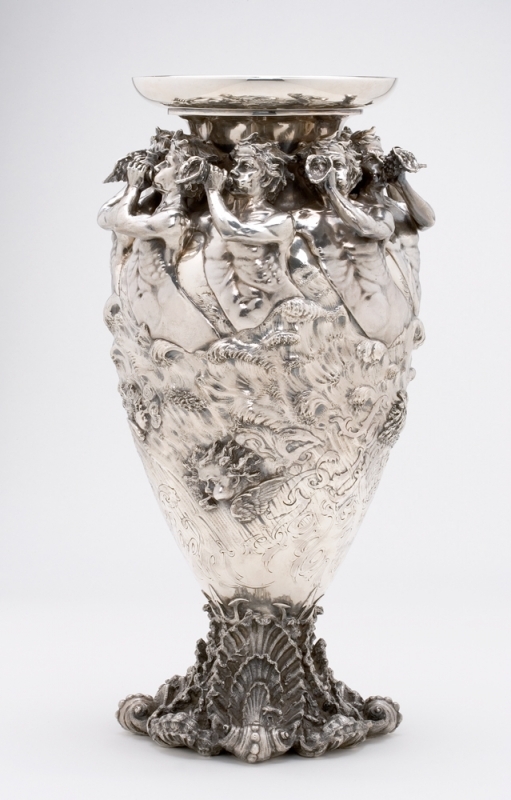 Covered in a maritime scene with waves and mythological creatures, the cup was awarded for an international yacht race held annually in Cannes, France. Chrysler Museum of Art. Henry Flagler’s steam yacht Alicia, 160’ long at the waterline, custom built in 1890 by Harlan and Hollingsworth of Wilmington, Delaware. Library of Congress. A rare perfect replica of the silver America’s Cup, the oldest and most coveted prize in the world of sport since it was won in 1851 by its namesake, the yacht America. William I. Koch Collection. This sterling silver and gold loving cup with a motif of sailing yachts, made Tiffany & Co. in 1895, was offered by John R. Drexel and won by Brooklyn Yacht Club Commodore B. Frank Sutton’s schooner yacht Loyal. Tiffany & Co. Archives. The 18-karat-gold Lipton Presentation Cup made by Tiffany & Co. and presented to Sir Thomas Lipton in 1930. Humorist Will Rogers solicited funds from American citizens to purchase the loving cup for Lipton after his final failed attempt to take the America’s Cup. Glasgow Life (Glasgow Museums). The tankard form was commonly adapted for use as yachting trophies in the mid-nineteenth century. This Tiffany & Co. silver tankard was won by the yacht Surge in 1863, 1864, and 1865 at the Ludington Boat Club regatta on Lake Michigan. Tiffany & Co. Archives. Sir Thomas Lipton’s challenger Shamrock II and Columbia, owned by a syndicate led by J. Pierpont Morgan, maneuvering for the start of the October 1, 1901, America’s Cup race. Library of Congress. 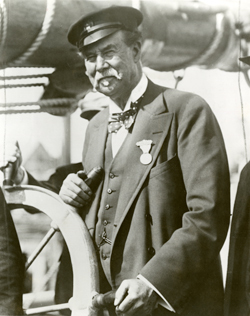 Sir Thomas Lipton, who lost five challenges for the America’s Cup between 1899 and 1930, but won the hearts of Americans through his generosity and good sportsmanship. 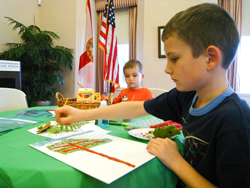 Flagler Museum. A wooden pitcher translated into sterling silver by Tiffany & Co., awarded at the 1956 New Bedford Regatta to the famous schooner America, not long she took the trophy that came to be called the America’s Cup in 1851. Tiffany & Co. Archives. The schooner yacht America, the winner in 1851 of what came to be known as the America's Cup, the oldest and most distinguished prize in the world of sport. Library of Congress.